...or Should that be Left? I'm a Scottish writer. But it's odd how history is coming to judge this, and by history I mean the internet. Tonight on one of my not-as-frequent-as-you-think egosurfing sessions, I stumbled across an article which was written about Unirally , the Super Nintendo game. A couple of years ago I'd been asked a few interview questions, offered up my answers, and didn't think much more about it. Now I've found the article, The Making of Unirally, and am chuffed that some of my answers made it in. I'll post more about Unirally in due course, but suffice it to say that the manual I wrote was called “ often hilarious” in the article and “hilarious” in the comments. To coin a modern fanboi phrase: squeeee! Which of course led to a more comprehensive search for myself with the qualifier “DMA”. This was the point that - contrary to information as recently as last year - the “founder member of DMA” infonugget is now everywhere ! This is what history, or at least the little corner which I'm in, will record. But confounding happens when, as tonight, I find that bits of my blog are being used as a Wikipedia reference. This is great! It means I'm an authority or some such damned thing. In the entry for Turbo Esprit, it repeats the BBC's Gameswipe claim that it was a direct inspiration for Grand Theft Auto, and uses my blog post as reference for the counterargument. Makes me sound controversial too! And calls me one of GTA's designers, which I'm really not. (Though Mike differs on this, maybe it was all my input on why it shouldn't be called 'Freeway' and the screeds of dialogue I wrote for it ). Perhaps, in the fashion of Douglas Adams' Dirk Gently , I can make myself the brains behind every game DMA ever made just by the simple expedient of constantly denying that I'm any such thing. And while I'm pasting in random thoughts, I had a vision of the future, of sorts. I now what picture my obituary will contain. When I sent off my interview answers, I also included a photo of myself for illustration which happens to be from the single weekend of my life when my haircut worked as advertised. It's about five years old now and makes me look like the sort of cool dude who's obviously super talented merely on the strength of the photo being both b/w and slightly out of focus. Which of course is why I picked that one. What I looked like at the time I actually wrote the manual was really, really geeky. And in colour. And no, I'm not posting the picture just now, at least not until I've digitally removed the spot from my forehead. I'm an amateur movie-maker and writer, as well as imagining I can do all sorts of things connected therein. My main achievement within living memory was being the director of a Star Trek fan film (Intrepid), which you can find in the links. I used to work in the computer games industry during the 80s & 90s, but I don't talk about that unless I've had a few drinks. 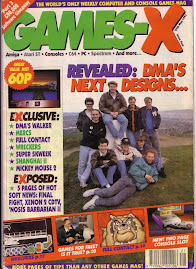 Yes, I appeared on the cover of a magazine - in 1990! That's me at the back on the left. This isn't self-important at all, is it?